Patricia was introduced to GROW BIOINTENSIVE Sustainable Mini-Farming when she was 8 years old. 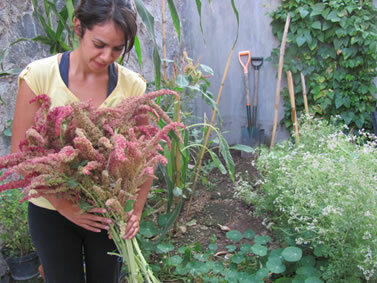 Her family established a demonstration garden in Simojovel de Allende, Chiapas, Mexico and trained local farmers, with special emphasis on providing training for children. In 2001, Patricia completed an internship with Ecology Action. Recently, Patricia finished her masters degree in Agricultural Economics at New Mexico State University. Her family has an 80-bed garden in Bachihiva, Chihuahua, Mexico and they continue training farmers. Patricia is interested in rural development, especially for arid areas. My mother's father was "a peasant" - he grew what he ate, bartered the food he grew for goods, and used his skills and knowledge to grow a living on a small parcel of land and bring his family forward. In contrast, I grew up in a city, and had lost touch with the traditions my grandfather knew so well. I wanted to regain that connection, and in 2000, I felt a strong need to begin cultivating the land - almost as though my grandfather was calling out to me. But I wanted to do it in a way that was friendly to and respectful of nature. After attending several workshops and investigating different low-impact cultivation methods, I was lucky enough to discover the GROW BIOINTENSIVE method, and from there I had a clear idea of what I wanted to do. In the beginning, I was teaching myself and, thanks to the good soil of my farm, the results were amazing from the start. Later I had the good fortune to meet Julio Cesar De La Garza and Juan Manuel Martinez Valdez, as well as other good biointensivistas across Mexico, who helped and supported my learning process and allowed me to delve deeper into sustainable Biointensive farming. Here's a picture of me in my thriving garden! First of all, I am a mother and grandmother and am concerned about the future of children. I am also in love with life. I have worked for nearly 20 years in organic agriculture, including seven years in the Costa Rican Ministry of Agriculture and Animal Husbandry as Manager of the National Program for Organic Agriculture; the remaining 13 years were spent working in private initiatives and on my own projects. During all these years, I gained valuable experience and received training in many areas related to sustainable development, organic agriculture (with emphasis on GROW BIOINTENSIVE) and permaculture while working with various community-based organizations to generate policies and support programs. I also managed to develop a wide network of contacts and friends who work in these areas, both in Costa Rica and internationally. In 2006, I bought the land that today is the El Casquillo farm. I have spent the last six years investing the savings I generated while working as a consultant to construct the infrastructure necessary to build this wonderful space, as well as living here while organizing networking and training activities. During the past year and a half I have been working on the recovery of the farm’s soils and on the development of the partnerships necessary to make a reality of my vision of a simple, abundant and happy life. My dream is to share the experience, expertise and contacts that I have accumulated with local communities, with volunteers and other stakeholders. I also dream of having a space where others can share their own knowledge, experiences and vision while enjoying and learning together. Felicia is an enterprising person, optimistic and full of dreams. That's why she visualized, founded and directs the Cultura Verde project (find it online at http://elcasquillo.wix.com/culturaverde). I am 32 years old, happily married to my wife Pryscila, and enjoying our baby girl of 10 months. I currently work at Xochitla Foundation A. C., a civil society organization located in Tepotzotlan, Mexico. The foundation's mission is to develop, consolidate and guarantee the permanence of an urban green area for public benefit and to encourage public participation in creating an area where humans can reunite with nature, in a way that we can all learn from and enjoy. I have been working as a field technician at the foundation for five years, and am responsible for the areas of production and information for maintaining green areas in Xochitla. I graduated from EARTH University of Costa Rica in 2006, with a degree in agricultural engineering. In October 2008 I attended my first three-day GROW BIOINTENSIVE workshop. In April 2009 I was selected to attend the six-month internship training at Ecology Action. During my internship, I learned about the philosophy and principles of Biointensive agriculture, reinforcing concepts that I could use for teaching the method through the Xochitla Foundation. On my return to Mexico, I began to establish a 500 m2 Biointensive orchard for teaching and training, research and production, with a capacity for 44 Biointensive growing beds. This achievement through a conference “Primer Encuentro Latinoamericano de Biointensivistas” organized in May 2010 organized by Ecology Action, Cecadesu, Ecology and Population and Xochitla Foundation, the latter being host. This event marked the formal beginning of the activities of our Biointensive garden, which meant we had a responsibility to provide training courses to different groups, such as seniors (INAPAM), school groups, social, business and international instructors CECADESU scholarships from SEMARNAT. To date, we have educated a total of 1191 people; 32 courses have been given, with an average 37 people attending each course. In 2011, I started training for basic-level teacher certification; I received my certificate in 2012 and am currently working toward certification at the intermediate level, which will allow me to train others as basic-level teachers. She has 10 years in Public Service with the Ministry of Agriculture, Queretaro State Government. She also has a Master's degree in Rural Tourism from the University of Argentina, and is a Private Consultant for Rural Enterprises. 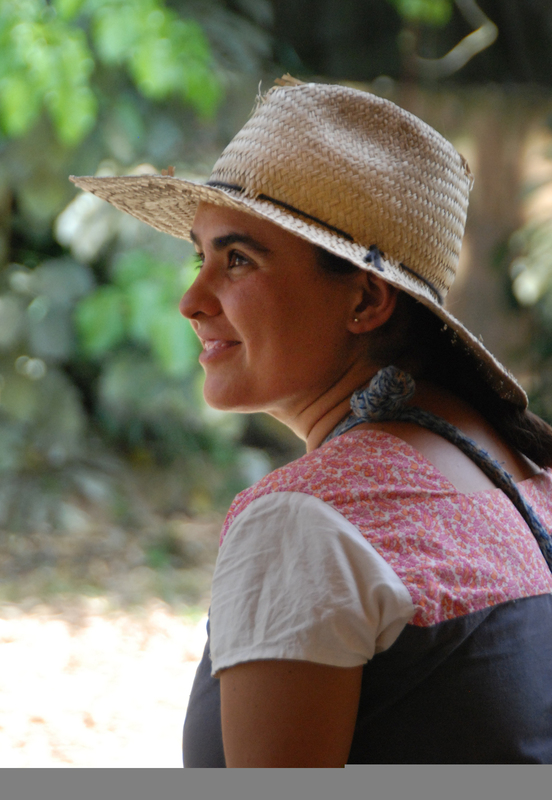 Gabriela becan to take Biointensive Agriculture courses with Juan Manuel Martinez in 2007, and is the owner of an Experimental Site for Rural Development (Biointensive Agriculture) in the mountains of Querétaro México. Gabriela is also the Founder and General Director of CIASPE AC, (Centro de Innovación de Agricultura Sostenible en Pequeña Escala A.C.), ONG founded in 2011 in the State of Querétaro, which is an organziation dedicated to promoting food sovereignty in marginal rural areas of México and South America through Biointensive Agriculture. Francisco: Hello! My name is Francisco Ruiz Orozco, I live in Mexico, in the state of Michoacán, in the town of Pátzcuaro. I graduated from the Faculty of Biology of the Universidad Michoacana de San Nicolás de Hidalgo in Morelia, Michoacán, México. Rosa Elena: Hello! My name is Rosa Elena Velazquez Molina, I live in Mexico, in the state of Michoacán, in the town of Uruapan. My profession is biologist from the Faculty of Biology of the Universidad Michoacana de San Nicolás de Hidalgo in Morelia, Michoacán, Mexico. I am the Head of the Academic Services Centre for Education and Training for Sustainable Development (CREDES) regional body under the Education and Training Centre for Sustainable Development (CECADESU) of the Ministry of Environment and Natural Resources (SEMARNAT). We started with our garden in the year 1998 with the NATURA VIVA environmental association, working with 4 growing beds and using composting; since then, we have learned much and expanded into true Biointensive techniques. CREDES has operated a Biointensive Demonstration, Research and Training Garden since 2008, and has trained a little over 1500 people from the different states that make the Mexican Republic. 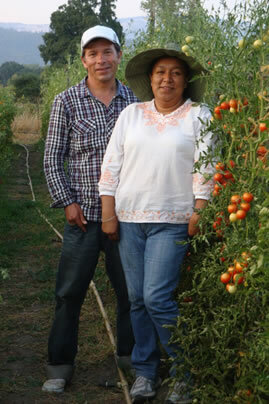 Rosa Elena and Francisco received Basic-Level Biointensive teacher certification in 2011, and completed internships at Ecology Action, in Willits, C.A. in 2012. They now provide training through online Biointensive courses, training Biointensive outreach workers. I was born in june the 6th, 1941 in Guadalajara, Jalisco, México. I graduated in 1966 as a Certified Public Accountant from the State Universidad de Guadalajara. I practiced accounting and finance for 34 years. Since my job was performed mainly in toxic environments, I was seriously ill since 1989, so I became semi-retired in 1991. Christine Einung, an excellent homeopath, cured me by means of a diet based in vegetables, water, exercise and yoga. She strongly recommended that I begin producing my own food; unfortunately, I had not the slightest idea how to do so. Then, in 1993, while learning “How to draw with the right hemisphere” at Kimball College in Meriden Massachussets, I saw for the first time in my life at a truly marvelous garden. My generous hostess left a copy of “How to grow more vegetables” in my room, and I immediately felt in love with the method. I immediately set out to get a copy of my own, which I found in New York. In 2004, I attended a 3-DAY GROW BIOINTENSIVE Workshop given by Ecology Action in Willits, CA. Taking what I had learned, I developed many workshops in the northern and central states of México and the Sierra Madre in Jalisco, (Reserva de la Biósfera de Manantlán). I keep the records and photos for my personal satisfaction, and a certain feeling of happiness in my heart. So far I am working in a 3 bed garden for my daughter Geo in addition to my own 6 beds. I am in debt to my teachers John Jeavons, José Manuel Martinez, Marisol Tenorio and Agustín Medina. 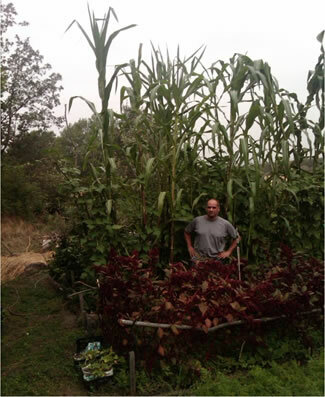 Omar is a Mexican biologist and biointensive enthusiast, from a family of farmers. His parents came to settle in Tepotzotlán Estado de Mexico in the early 70's. As the fourth of five children, Omar attended basic studies of primary and secondary school next to his brother Alexander, in his beloved village of Tepotzotlán. He studied in the upper town where he was born, in Tlalnepantla de Baz, at the School of Advanced Studies at UNAM Iztacala, where he received a degree in biology, graduating in 2009 and joining work at the ecological park established by the Xochitla Foundation A. C., in Tepotzotlan, Mexico. 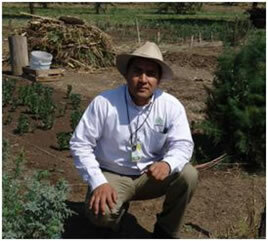 In Xochitla, Omar worked in the organic Biointensive nursery and demonstration garden since 2008. He got his start taking care of the Biointensive garden while his friend Mateo Gonzales (also a Biointensivista) attended a 6-month internship at Ecology Action. And the work paid off: in October 2011 Omar was able to attend the teacher certification workshop held in Patzcuaro Michoacán CREDES where he achieved Basic-Level Teacher Certification after one year. At the end of 2012, Omar left Xochitla to start a new profession and formed the group Colectivo Centli Hombres de Maíz promoting organic farming through Biointensive farming and its benefits, and working with productive projects such as the local womans group growing Coyotepec dahlias, forming the group Esmeraldas en la Dalia. Born in Querétaro city, México, I grew up in the city but, because of my grandfather, I was always near to the countryside and I learned to love nature. I studied agronomy but I realized how bad the impact of industrialized agriculture is to the planet and therefore to life, and also realized how little awareness we have of this. After graduating, I start to learn and implement urban agriculture by making an edible garden at home and teaching family, neighbors and friends why it was important, and how to do it. 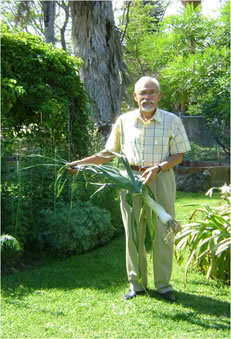 Then, I had the opportunity to have an entire field, and I began to grow corn, beans and zucchini in an organic way. I have been always close to rural communities and to the most marginalized people of the State. I could see their reality and their needs, so I learned to use Biointensive methods, and started a program to promote this kind of agriculture with 2,500 families. Now, I am working in a civil movement called “El Maíz Más Pequeño” participating in a project to include sustainable agriculture in upper secondary-level education as a tool against climate change. I am also involved in other sustainable projects in the city with other groups, and am trying to make a transition to true sustainability in my own life. 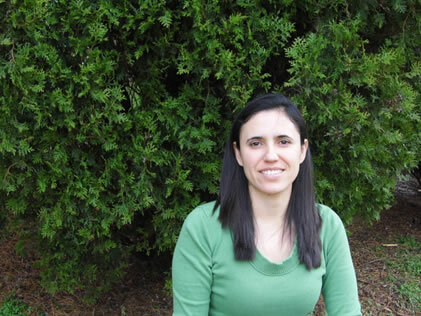 Agueda majored in biology at Universidad Nacional Autónoma de México and she has a master’s degree in Environmental Biology with a focus on Ecological Restoration. She has worked in ecological studies at the Reserva del Pedregal de San Ángel in Mexico City, and in the Sierra de Huautla in Morelos, from 1998 to 2006. Her research focuses on the regeneration and restoration of damaged ecosystems. She has participated in the development of the management program Parque Urbano de Tlalpan in Mexico City. 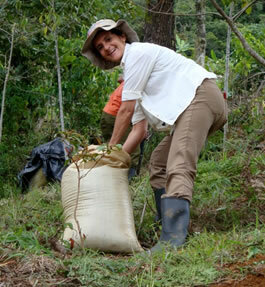 She also worked at the Comisión Nacional de Áreas Naturales Protegidas from 2000 to 2002. She taught the subject in Ecology I at the Faculty of Science at Universidad Nacional Autónoma de México and the subject of Biology in high school from 2006 to 2009. In 2009, she had the opportunity to encounter the Biointensive method at the Education and Training Centre for Sustainable Development, where she is currently working as a Chief of the Training Department of Rural Organizations. Since then, she has been working with promoters to train them through workshops in different states of Mexico. In 2010; she started e-learning training with the method for the formation of biointensive promoters. 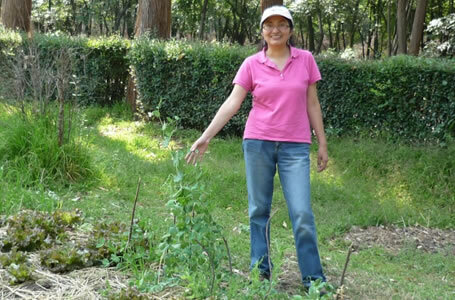 Finally, she is in charge of the work done in the Biointensive demonstration garden Viveros Coyoacan in Mexico City. Edith has a 4-year-old daughter, and enjoys reading books in her spare time. 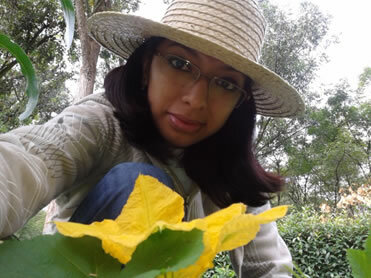 Clara Isabel: Engineer in agroecology with a master's degree in science in rural regional development. Currently, she is an researcher at the Intercultural University of Guerrero State; her research focuses on development grounded in biointensive agriculture. 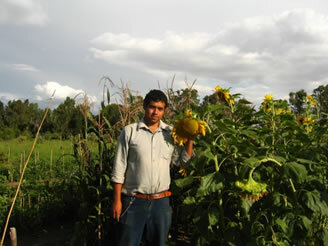 Gerardo:Engineer in agroecology with a master's degree in science in rural regional development. Currently he is an researcher in the Intercultural University of Guerrero State his research focuses on using organic agriculture and domestic technology to the exploit bioenergy. 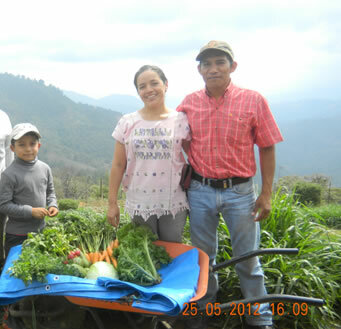 Clara and Gerardo have established a demonstration garden in the high mountains of Guerrero State to promote and research Biointensive agriculture. Since January 2013, they are working with Biointensive agriculture in Ayutla de los Libres, a town in the costa chica of Guerrero State. I have a degree in Biology for the Facultad de Ciencias de la UNAM, (Science Faculty), specialized in entomology and botany. I am a professional commited to sustainable development, focused on creating a higher quality life to people, and think that providing training to encourage the use of environmentally- friendly methodologies is very important. Since my introduction to the Biontensive method in the Encuentro Latinoamericano de Agricultura Biointensiva in Xochitla, I´m applying this method, at present in collaboration with the Centro de Educación y Capacitación para el desarrollo Sustentable ( Center for the Sustainable Development Education and Training), a department under the Secretaria del Medio Ambiente y Recursos Naturales Semarnat (Secretary for Environment and Natural Resources), giving Biontensive crop workshops to people from different states of the Republic, with on- and of-site courses, providing training to developers in all levels and in a variety of climatic conditions. In our training and demonstration site, we have a mini farm of 540 m2, and have established 15 biointensive beds to 10m2 with the following crops: garlic, onions, maize, potatoes, tomatoes, lettuce, cucumbers, alfalfa, soybeans, carrot, collards, wheat and aromatics plants. 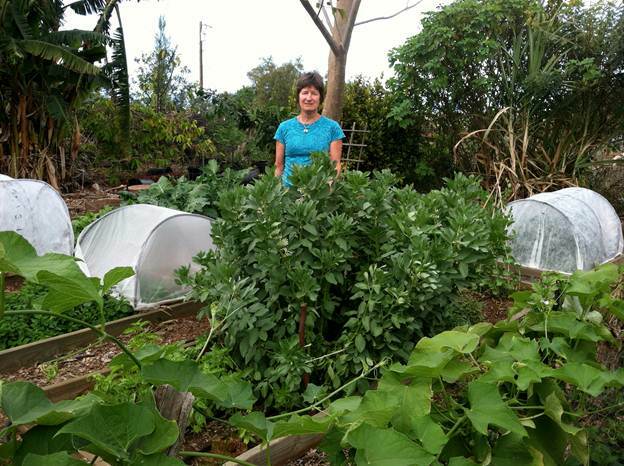 Cindy Conner founded Homeplace Earth to provide permaculture education with an emphasis on sustainable food production. She researches how to sustainably grow a complete diet in a small space at her home near Ashland, VA, and has produced the videos Develop a Sustainable Vegetable Garden Plan and Cover Crops and Compost Crops IN Your Garden. 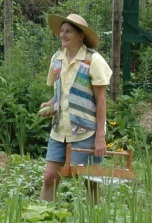 Cindy, a former market gardener, was instrumental in establishing the sustainable agriculture program at J. Sargeant Reynolds Community College in Goochland,VA and taught there from 1999-2010. She is now working on how to get food from the garden to the table using the least fossil fuel and has built and is using solar food dryers. Karla is a native of Guadalajara and received a degree in Biology at the University of Guadalajara. After graduating she went to work at Las Cañadas in Veracruz state, an ecological retreat in a conservation reserve. 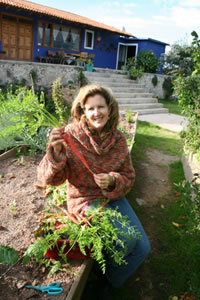 She is the garden manager of 140 Biointensive beds, gives tours for school children and helps teach workshops. In 2003 Karla was a six-month intern at the Ecology Action Mini-Farm. Since then she also interned for six months with Jodi Roebuck in New Zealand to learn seed production techniques. She is now growing and selling seeds along with her other activities at Las Cañadas. Steve is currently teaching and directing the AgroEcolgy Program at Elon University, Elon, NC. He is the director of the EA certified Biointensive Research and Demonstration site at Elon NC and program director for the Peace Corps program at Elon University. Previously he was the Small Farm Unit Manager and Agriculture Energy Specialist at the Center for Environmental Farming Systems, North Carolina State University. He was part of the National Cooperative Extension team to develop E-extension education and information on sustainable energy production and utilization in agriculture. He is an associate editor of the peer review journal, Renewable Agriculture and Food Systems. He was the past Director of the Center for Sustainable Living at Wilson College, Chambersburg, PA, and founder of the Robyn Van En Center for Community Supported Agriculture Resources. He is co-founder (with his wife, Carol) of Harmony Essentials, a company dedicated to the vision and practices of a sustaining food system. Steve was appointed to the Pennsylvania Sustainable Agriculture Advisory Board, served two terms on the board of directors for PASA (Pennsylvania Association for Sustainable Agriculture) and currently serves as the Vice President of the Board of Directors for Ecology Action, Willits, CA. He has done extensive consulting and provides presentations and workshops worldwide. Steve and family have farmed and gardened organically for over 35 years. He has used Biointensive techniques for 20 years in market production of fruits and vegetables. He has a diversified farm background including small fruits, vegetables, bees, dairy cows, draft horses and other livestock. Steve has also been a pioneer, researcher and advocate for solar greenhouse and high tunnel production for over 25 years. 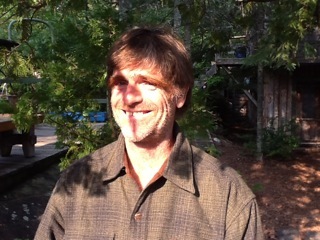 He is an intermediate certified GROW BIOINTENSIVE® instructor and is design certified in permaculture. In early 2009 Margo and Dan each completed a three-year apprenticeship with Ecology Action in GROW BIOINTENSIVE® mini-farming and spent the following growing season as field coordinators at EA's partner site at the Golden Rule mini-farm site. They began farming at their own site "Circle of the Sun Farm" in Trotwood, Ohio, in 2010. 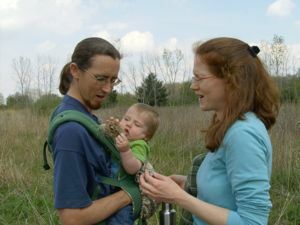 Since then, in addition their own farming work and welcoming their sons Alten and Isaac to the world, Dan and Margo have been actively involved in teaching Biointensive. They have been visiting teachers at Ecology Action 3-Day workshops in California, and have hosted Ecology Action interns from Africa at their site in Ohio. Marisol has lived all her life in the city of Aguascalientes. She and her father volunteered in the NGO, Aguascalientes Ecological Conscience for 15 years. They organized recycling campaigns and pressured the state government for better policies on land use and environmental and water pollution. They also investigated a region where many people had kidney problems, which they suspected were due to conventional agricultural practices. This work led her towards a more sustainable agriculture. With a university degree in Biology, Marisol´s job is with the State Environmental Protection Agency. However, her real passion is for her volunteer work. Agustin has also lived his whole life in Aguascalientes. However, he used to go into the countryside with his father, who worked as manager of a state natural reserve. He could see that life was simpler there and he also began to understand the people´s problems. He studied Agribusiness at the university, but didn´t agree with the Green Revolution. His emphasis was on Ecology and Rural Development, where he started learning about ecology issues. After university he took a six-month course from a Biointensive teacher and also started teaching sustainable development on a volunteer basis. His paying job is for the State, as coordinator of a rural sustainable community project. Agustin and Marisol met in 2000 and married in January 2006. In April 2006 they both became Ecology Actioninterns at the Golden Rule site. After returning home to Mexico they developed a demonstration/training site, “El Mezquite,” in Aguascalientes state. From February 2008 through January 2009 they trained 101 people during 195 hours of formal teaching and made presentations to 305 people in less formal settings. This included teaching in a 5-day course at the Xochitla Nature Preserve near Mexico City. Data for the year showed that their soil had a 0.1% increase in organic matter. Because of their work, the two received Intermediate certification in 2009. Allan attended two-Three Day Workshops with John Jeavons,one in Iowa and one in Wisconsin. In addition, he attended the 5 day Basic Level training in Willits with John Jeavons and Carol Cox. He presently maintains a plot at a local community garden and in his own back yard. 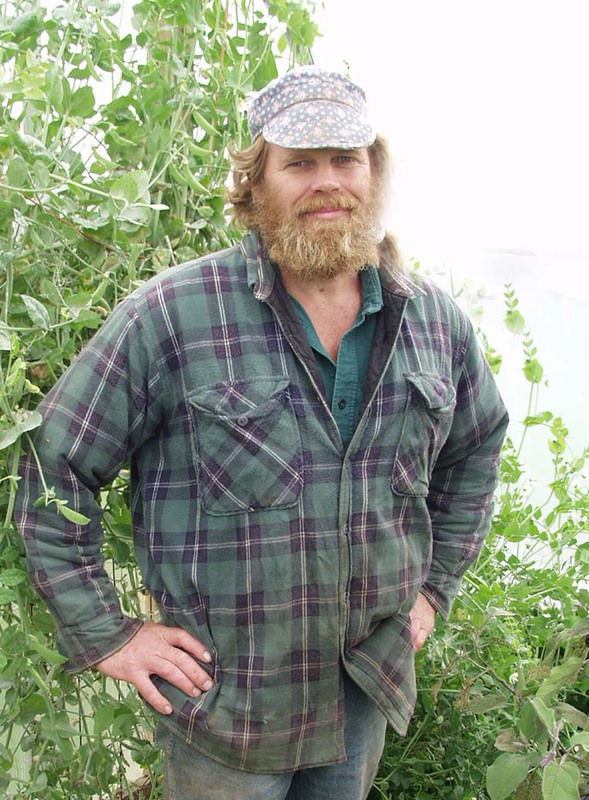 He teaches gardening classes through River Market Co-op in Stillwater, MN. 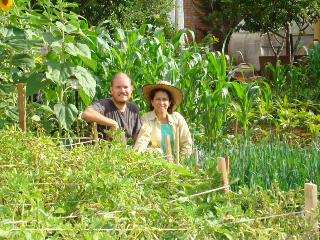 The community garden is located on a large tract of land two miles from Stillwater. Adjacent to the garden are two other small-scale farms. Allan is working with one of the farmers who grows heirloom dry beans for local restaurants. They will be exploring ways to commercially grow heirloom pole beans and peas including The Dutch Capucijners pole pea, Potawatomi pole lima bean from the Potowatomi Nation, and Good Mother Stallard pole bean. Allan is presently painting homes and teaching for his family's income needs. Allan was asked to establish a garden for a family a few years ago, and, with the assistance of the owner's daughter removed sod and double-dug about 450 square feet. There were plenty of resources available to him to perform the ground preparation with a machine but then the opportunity to learn would have been lost. He was also the director of a small Montessori School in northern Minnesota. During his Montessori training in the 1980's, he was introduced to the book How to Grow More Vegetables… and found that young children are naturally drawn to nature and establishing relationships with plant and animal life. He found that children, when exposed to work in a garden, will often insist on having one established at their home. GROWBIOINTENSIVE gardening, meditation, and spiritual growth are some of the most important experiences in his life. Nikki has been utilizing GrowBiointensive methods on her 5 acre Northern California farm for 6 years now, teaching classes and providing fresh produce for the local food closet. A recent move has taken her in a new direction to Maui where she is partnered with a chef committed to providing the freshest ingredients in the food he prepares. She is looking for property to farm and an area where the public can come and learn about GrowBiointensive techniques and sustainability. Her greatest joy is teaching others to grow grains; to thresh, winnow and mill their own flours and meals. She is currently providing fresh milled flours, breads and granola at the local Farmer’s Market. Justin has had a diverse array of life experiences that have added to his knowledge and skill base. From three years as a monk in India to living and working on a schooner in Hawaii, to working as Co-Director of Programs in Japan for the David Lynch Foundation, he has always pursued work for the betterment of humankind and the environment. As an Ecology Action intern, Justin worked in 2009 and 2010 to help develop the Green Belt Team for teaching Biointensive sustainable farming in developing nations, and set up the Mini-Farm site for internships on California's Mendocino Coast. Justin has recently been teaching and presenting Biointensive farming workshops across the nation as a co-founder of the Compass Green Project. Compass Green is a school garden on wheels. It is a fully functional greenhouse built in the back of an 18ft. box truck that grows vegetables, grains, and herbs and is powered by waste vegetable oil. Justin and his team teach practical farming tools and raise awareness on sustainability through presentations, workshops, and greenhouse tours at schools, and events across the country. They feel that everyone, regardless of demographic and age should have access to sustainability education and delicious healthy food.